Drawing on a wealth of history and anthropology, Ehrenreich uncovers the deep origins of communal revelry in human biology and culture. Although Europeans from the sixteenth century onward viewed mass festivities as foreign and "savage" Ehrenreich shows that they were in fact indigenous to the West, from the ancient Greeks' worship of Dionysus to the medieval practice of Christianity as a "danced religion." Ultimately, church officials succeeded in driving the festivities out of the churches and into the streets (where they became "carnival"). Following the same pattern of repression, Reformation Protestants criminalized carnival, Wahhabist Muslims battled ecstatic Sufism, and European colonizers wiped out native danced rituals. Elite fears that collective festivities would undermine social hierarchies were not entirely unjustified: the festive tradition inspired French revolutionary crowds and countless uprisings of slaves and colonized peoples from the Caribbean to West Africa to the American plains. Yet a tradition so deeply ingrained is not easy to annihilate, Ehrenreich argues, pointing to recent outbreaks of group revelry, from the rock 'n' roll rebellion of the 1950s-'60s to the "carnivalization" of sports events in the 1980s-'90s. 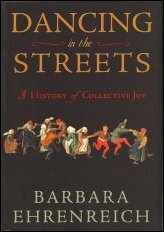 Original, exhilarating, and profoundly optimistic, Dancing in the Streets concludes that we are innately social beings, impelled almost instinctively to share our joy, and therefore able to envision, perhaps even create, a more peaceful future.